Fascinating stuff, Patrick. Of particular interest to me, and my family, is that the house in which I grew up on the Burrow Road in Sutton, north Dublin, a Victorian villa called "Walmer," (still extant, although most of the garden was sold off many years ago for apartments) and which was built in 1897, was ( acoording to Thom's Directory for that year) originally occupied by a "Miss King-Harman" who was almost certainly related to the two officers mentioned in your article. Growing up in Howth, there was a local rumour that Walmer, which was built on land which, like almost all land on the Howth peninsula, was part of the Howth Castle estate, had been constructed by the last Earl of Howth, who died in 1904, as a seaide home for his then mistress, i.e. Miss King-Harman. As they both came from the same aristocratic stratum of society (NOT, I hasten to add, that of the common-or-garden Thompson family who arrived at Walmer in 1959) I think this supposedly Apochryphal story has, in fact, some strong basis in truth. Accordingly, I would be grateful if you would put me in touch with the genealogist concerned so that we may compare notes, so to speak. You should know that my youngest brother, Aubrey, was married at St. John's in 2002 to Aislin Macdonald of Brighton Vale, Monkstown, and Argyllshire, and that they now live in Kinross, Scotland, where they are parishioners of the local Scottish Episcopal Church. Very interesting read, Patrick. 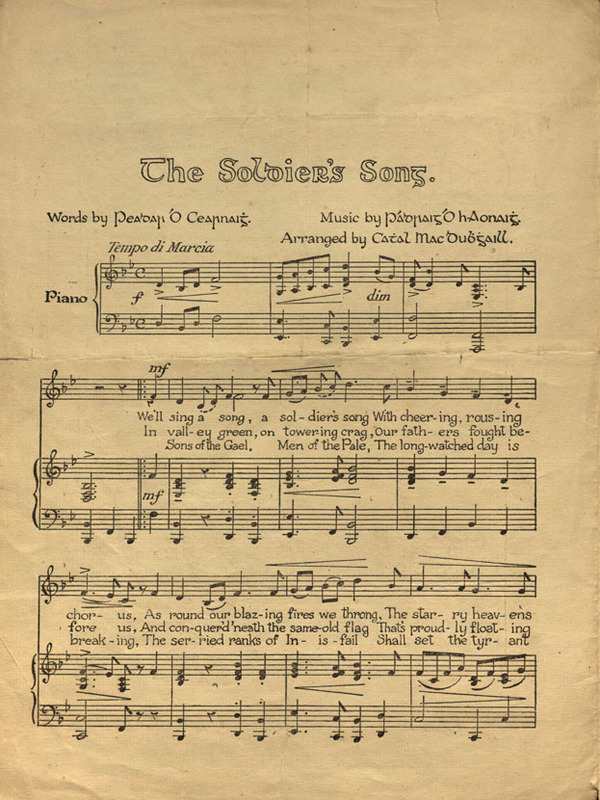 The only thing that I would query is when you say that the early sheet music of 'A Soldiers' Song' acknowledges Mac Dughghaill as the 'composer'. I know it's a matter of semantics, but, he was the 'arranger' rather than the 'composer', which is quite a different thing. 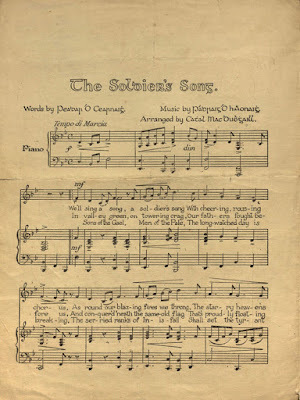 Paddy Heaney was the 'composer' and the story of the tune's composition is in Seamus De Burca's bio of O Cearnaigh titled 'The Soldier's Song' (Chapter 4). Heaney was not able to notate music (he picked out the tune on a melodeon), so the first notation actually was done by Sean Rogan who trained and conducted the Emmet Choir in Dublin, of which Heaney was a member. The biography is a fascinating read as some of the chapters were written by O Cearnaigh and others by De Burca (his nephew I believe). Three to Captain L.H. King-Harman, Royal Flying Corps late Royal Horse Artillery, 1914-15 Star (Lieut. & Adjt. L.H. King-Harman. R.H.A. ); British War and Victory Medal (Capt L.H. King-Harman). Mounted as worn. Sold for £470 (€543) inc. Premium. Captain Lawrence Hope King-Harman, R.H.A., attached R.F.C,. was the elder son of Sir Charles and Lady King-Harman, and grandson of General Sir Robert Biddulph, G.C.B., G.C.M.G. He had been educated at Bradfield and R.M.A. Woolwich; Obtained his commission in the Field Artillery in July 1909, and joined his battery in India. 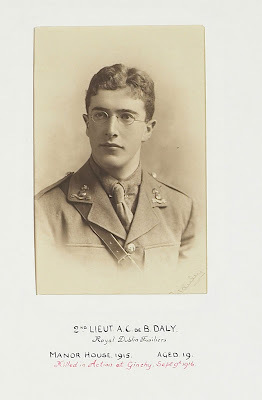 In June, 1915, he was selected for the Royal Horse Artillery, and took part in the Mohmand Expedition on the North-West Frontier, for gallant conduct in which, he was mentioned in despatches. 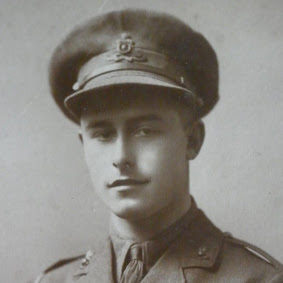 Early in 1916 he responded to a call for volunteers for training as observers in the Royal Flying Corps in India, and proceeded to Mesopotamia in June, attached to that branch of the service (the 30th Squadron Royal Flying Corps) On arrival at the front he was placed in temporary command of a field battery, and rejoined the R.F.C. shortly before his death. He was killed in an accident while flying on October 26th 1916, age 27 and was buried in Amara War Cemetry, Iraq. In a previous generation of the King-Harman family, the Hon. Laurence Harman King-Harman (6th February 1816 - 10 October 1875 — second son of Lord and Lady Lorton) came to notice in the controversy involving The Reverend Charles Marlay Fleury D.D., Chaplain of the Molyneux Asylum for Blind Females, 34 Peter Street, Dublin, and The trustees of the Asylum. This is an extract of my working chapter dealing with the history of that asylum, in my History of Blindness in Irish Society. 1 of three. “With the decline in that quarter of the city around Peter Street and the removal of ‘persons of quality’ to the new suburbs, the income from the asylum chapel dropped dramatically. Apart from its money worries, the Molyneux was about to face into an altogether different crisis which would mar its reputation for some number years. The Reverend Charles Marlay Fleury D.D., who was to be associated with the asylum for over 20 years, lived in Upper Leeson Street which had become a fashionable suburb of the city (He would later be a central player in the removal of the Molyneux Asylum rom Peter Street to Leeson Park.) He was a renowned preacher, having been active in the church in Waterford, and ran a successful school for young Protestant gentlemen. He was accounted ‘a man of great popular talents whose preaching kept the church always crowded by a respectable congregation’.45 It was during his term of office that a major controversy threatened the stability of the asylum. In July 1941, on the closure of the old Molyneux chapel, Peter Street, a marble plaque was removed from there and placed in St. Mary’s Church, Mary Street — where it can be seen today, above the door leading to the toilets in what is now Keatings Restaurant — where the founder of Simpson’s Hospital for Blind and Gouty Men, George Simpson worshipped. Reading the plaque, one is drawn to the undoubted pathos and honorific of its sentiments and in the cold insular crypt of time, one accords due credit to its subject. But the Rev. Fleury appears to have had tendencies which the plaque does not record — according to two pamphlets published in 1857. They claimed that the decline of the asylum and the abrogation of the duties of the trustees were mostly due to him; and his arrogation of duties within the establishment or his acquiescence with a regime of ‘mismanagement of the asylums affairs’ were the reasons why the publishers had taken pen in hand in the first place. The two publications were Truth, or a Review of the 14th report of the Molyneux Asylum, and The Veil partly withdrawn; or further revelations in connection with the Molyneux Asylum — both by L. H. King-Harman (Lawrence Harman) and Henry Allnutt. Both were subscribers to the asylum; Allnutt, an Englishmen, was a land drainage engineer and land agent with offices at 61 Middle Abbey Street, Dublin and at 49a Lincolns Inn Field, London; L. H. King-Harman, was from Newcastle, Ballymahon, Co. Longford, who also had a Dublin address at 8 Ely Place. Both pamphlets are self-regarding, slightly repetitious and might be considered a single publication. This was finally settled by the arbitration of the Honorable Mountifort Longfield (then of St. Stephen’s Green, Dublin). The findings and terms of settlement were later printed at the Educational Depository, Kildare Place, in 1914. Cecil MacDowell was my mother's uncle. It is good to see some interest in him, as I think he was a bright and enthusiastic young man. Cecil's youngest nephew (my uncle) just died in British Columbia, Canada at the age of 80.